Remember the super adorable Hummus Veggie Snails from our recent garden party? Well here they are again! How fun are these little guys?! They also made an appearance at our Firefly Hollow menu a while back. I’ve been spreading hummus on tortillas and rolling veggies inside for years as a snack and school lunch addition for the girls. I thought they would look so cute perched on top of baby carrots to resemble snails. Guess what? I was correct! These cuties are so fun to make. I usually go for hummus, carrots, cucumbers, and red bell peppers as my fillings. You can use pesto, cream cheese, or any other spread plus your favorite combination of fillings. Peanut butter and jelly snails? Yes please! Scroll down for more fun summer snacks from friends below! 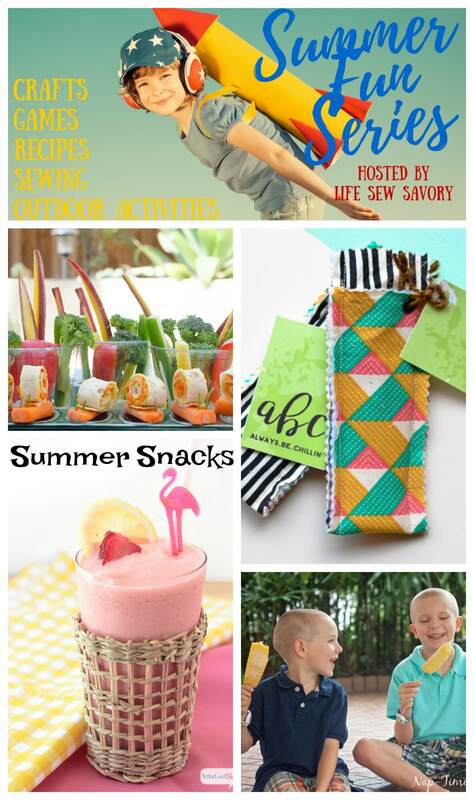 You can also check out all the other craft, sewing and food posts from the Summer Fun Series HERE on Life Sew Savory. Place a tortilla on a flat surface in front of you. Spread all over with hummus. Sprinkle the veggies on top of the hummus, leaving one edge empty so the hummus will act as a glue. Roll up the tortilla tightly into a spiral, and cut into 1/2 inch pieces. Cut baby carrots lengthwise into thirds, and use a wooden skewer to poke two holes in one end. Place a tortilla piece onto the baby carrot, and insert a chive piece into each hole.